Scientists reveal that a fault in the process that copies DNA during cell division can cause epigenetic changes that may be inherited for up-to five generations. They also identified the cause of these epigenetic changes, which is related to the loss of a molecular mechanism in charge of silencing genes. Their results, which will be published in Science Advances on 16 August, will change the way we think about the impact of replication stress in cancer and during embryonic development, as well as its inter-generational inheritance. The researchers, led by ICREA research professor and group leader at the CRG Ben Lehner, also identified the mechanism causing these epigenetic changes. “For the correct function of cells and ultimately the health of the organism, it is important to keep certain genes active and others silenced. Inside cells, there are DNA-protein complexes called heterochromatin that prevent genes from becoming activated when they should not be. 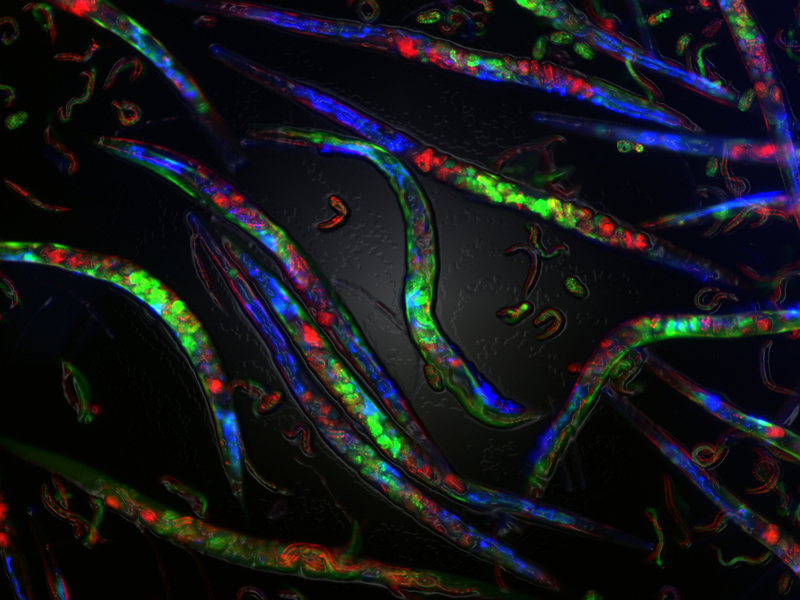 Initially, we noticed that a gene artificially inserted into the worm genome and normally silenced by heterochromatin was activated in animals that carried mutations in proteins involved in the copying of DNA,” explains Tanya Vavouri, CRG alumna currently group leader at IJC and IGTP and coauthor of this study. “We found that this was caused by loss of heterochromatin and that other genes also silenced by heterochromatin were activated too. Unexpectedly, the gene was inappropriately activated for five generations in animals that did not carry the mutation in DNA replication but had ancestors that did,” she adds. “Our results show that impaired DNA replication not only causes genetic alterations but also genome-wide epigenetic changes that can be stably inherited,” says Ben Lehner, senior author of the paper. An important question in epigenetics is the extent to which epigenetic states are transmitted between generations. Lehner and collaborators are addressing this and other questions from many different angles. They previously reported that some temperature-induced gene expression changes can also be inherited between generations. “We hope that our work will change the way people think about the impact of replication stress during tumorigenesis and embryonic development as well as about inter-generational inheritance,” he concludes. A. Klosin, K. Reis, C. Hidalgo-Carcedo, E. Casas, T. Vavouri, B. Lehner. “Impaired DNA replication derepresses chromatin and generates a transgenerational inherited epigenetic memory”. Science Advances. 3, e1701143 (2017). DOI: 10.1126/sciadv.1701143. This work was supported by the European Comission through a European Research Council (ERC) Consolidator grant (616434), the Spanish Ministry of Economy and Competitiveness (BFU2011-26206 and ‘Centro de Excelencia Severo Ochoa’ SEV-2012-0208), the AXA Research Fund, the Bettencourt Schueller Foundation, Agència de Gestió d’Ajuts Universitaris i de Recerca (AGAUR), Framework Programme 7 project 4DCellFate (277899), and the European Molecular Biology Laboratory–Center for Genomic Regulation (CRG) Systems Biology Program. Adam Klosin was partially supported by a la Caixa Fellowship. Eduard Casas and Tanya Vavouri were supported by the Spanish Ministry of Economy and Competitiveness (BFU2015-70581 and IEDI-2016-00787) and by an FI AGAUR Ph.D. fellowship to Eduard Casas. Laia Cendrós, Media Relations, Centre for Genomic Regulation (CRG) - Tel.+34 93 316 02 37.